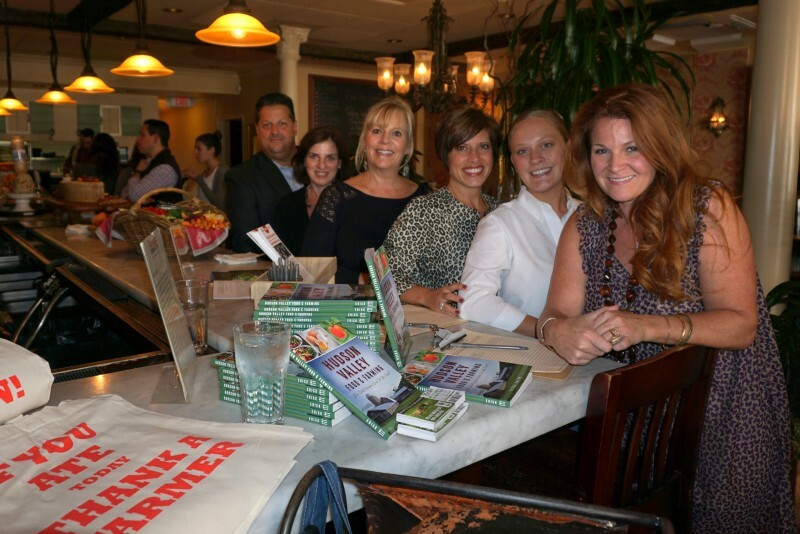 A recent gathering of support for the FarmOn! Foundation at Café of Love in Mount Kisco offered an instant reminder of what constitutes the most ideal farm to table food. Just because something states “farm” does not mean a food is healthful, reminds FarmOn! Foundation founder and Family Farm advocate Tessa Edick. “It can make a big difference in your family’s healthy development when you eat fresh food acquired directly from a family farm,” said Edick. While learning about FarmOn!, attendees enjoyed a platter of family farm fresh veggies and also Café of Love’s signature fried chick peas and beverages from the café’s beautiful lounge area while learning about FarmOn!. The event was sponsored by Houlihan Lawrence. FarmOn! Foundation in partnership with the Poughkeepsie Farm Project and local support in the Poughkeepsie School District is presenting “Back to the Farm,” this month, a month-long series of events in the Poughkeepsie School District celebrating local farms and local food. FarmOn! Staff explain that there’s a missing link between farms and schools and that it’s essential that we bridge it for the health of our children and our communities. FarmOn! Foundation is sponsoring the school cafeterias to serve a locally-sourced dish featuring Slope Farm to School New York State Ground Beef to more than 4,000 students district-wide throughout the month. Students at all four elementary schools will also enjoy tastings of local raw vegetables provided by the Poughkeepsie Farm Project, local milk provided by Hudson Valley Fresh, local apple taste tests lead by the Dutchess County Department of Health’s nutrition educator, and cooking demos and tastings of locally sourced vegetable dishes presented by chef interns from the Culinary Institute of America. Every 2nd grader district-wide will visit the Poughkeepsie Farm Project, seeing how food is grown, harvesting and tasting fresh vegetables straight from the ground. Every 4th grader district-wide will visit a Hudson Valley Fresh dairy farm and see how cows are milked, tasting fresh milk and yogurt. Other interactive activities and demonstrations are also planned. FarmOn! Foundation is a non-profit organization of professional farmers, educators, influencers, supporters, nutritionists, students, and community leaders invested in the future of local agriculture and building local economies. FarmOn! Foundation creates and funds youth educational programming and is working to preserve family farming in America with an edible education. Some of FarmOn! Foundation partners include TasteNY, John Varvatos, Bronx Zoo, NYS Department of Ag & Markets, Local Economies Project, Hudson Valley Fresh, Maple Hill Creamery, Yelp, Whole Foods Market, Modern Farmer, Cornell University CALS, NBA, Disney, and SUNY. In the first-ever partnership of its kind, students at SUNY Cobleskill, Morrisville State College and the Cornell University College of Agriculture and Life Sciences will be able to live and work at the Foundation’s working farm– FarmOn! at Empire Farm in Columbia County in New York State gaining real life experiences in the food production field. Learning will range from seed and soil crop planning to growing food, harvesting it, producing, and cooking food in a commercial teaching kitchen and extend all the way to custom growing for New York’s institutions, caterers, retailers and chefs. For additional information, please visit www.farmonfoundation.org.